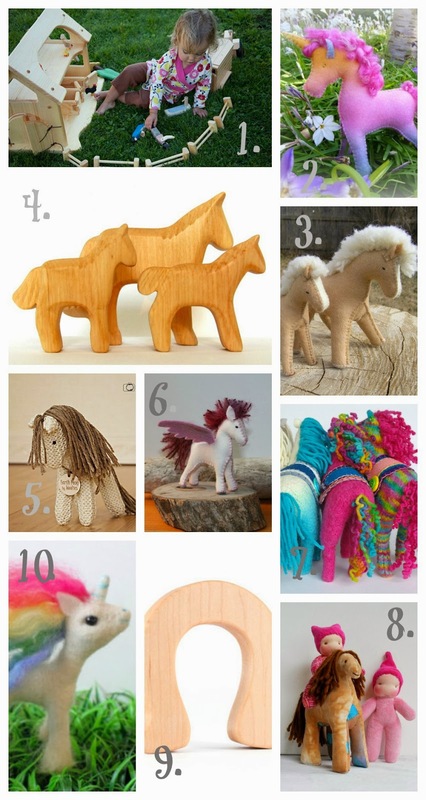 So many lovely, natural and handmade horses and ponies! Here at BTRT we love to round up the natural goodies for you to enjoy, almost as much as we love horses. Almost. With spring just around the corner (hear that Spring? just around the corner! ), the thoughts of a young girl and her mother naturally turn to horses. We have had enough of the snow and we are ready for leather and buckles and peppermints, manure, rubber boots and whiskery chin rubs and head butts for treats. Until then, we will make do with these truly wonder-full finds, all handmade by Etsy artisans. and maybe bring home a pony of your own. 1. Natural Wooden Stable , by A Toymaker's Daughter. 2. Wool Felt Unicorn, by Deb's Steiner Dolls. 3. Palomino Mare & Foal, by Holly's Meadow. 4. Wooden Horse Family, by Baumstammbuch. 5. Earth Pony, by Woolies. 6. Pegasus Foal, by MOLICA Australia. 7. Felted Wool Horse, by Beneath the Rowan Tree. 8. Mini Twinkle Pony, by Star Village Toys. 9. Horseshoe Teether, by Smiling Tree Toys. 10. Needle Felted Rainbow Unicorn, by Happiness Bluebird. Thanks for making these collections! I always see something I haven't seen before.